Home » sewing » >New-To-Me Vintage Sewing Machine! >I had to share my newest fun find! This was waiting for me at a thrift store a few weeks ago- it’s a vintage Pfaff 230 machine with table and chair. I found it for… (drumroll please)… just over $30! Crazy, right? I was working on my new swimsuit on this machine (sneaky-peek on the dress form in the pic). It’s the first machine I’ve owned that’s powered by a knee lever. Interesting! I’ve worked on industrial machines with a knee pedal for lifting the foot but never one powered by the knee. It’s something to get used to! I love how the little chair pulls out and has two drawers at the bottom. 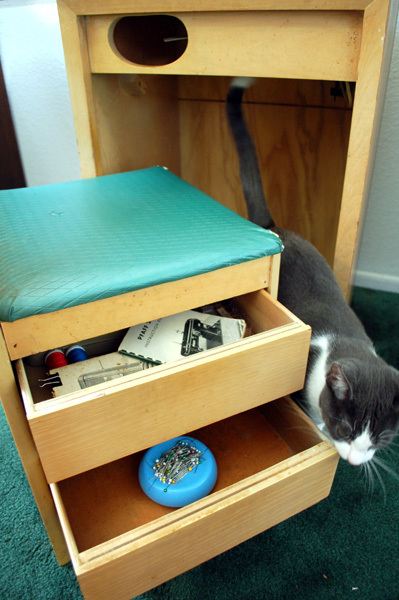 Perfect to keep pins away from curious kitties- even if they try their darndest to find them anyway (example above). The machine folds down and the flap covers the top- and when you put the chair back in it looks like a little mid-century end table. It’s really pretty tiny! That’s German engineering for ya. I was too lazy to fold down the table for pics, but you get the general idea of what it looks like all closed up. I really like the machine and it runs really well, even without a professional tuneup. It must have been pretty high end because it’s got all sorts of different stitches it can do- though I haven’t tried any out yet. It looks kind of intimidating! It doesn’t go as fast as my modern Pfaff machine which is the only real downside I can find with it. I like sewing FAST. It’s fun. Yay for new toys! Especially new toys that are vintage and sewing related! 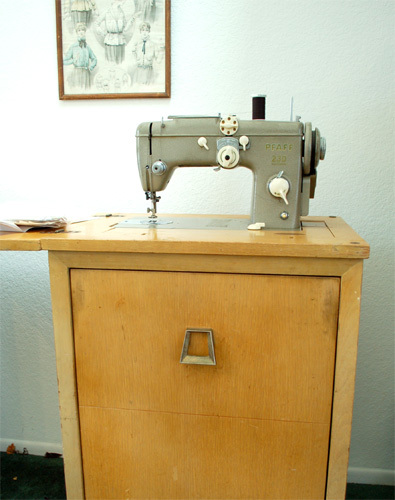 23 Comments on >New-To-Me Vintage Sewing Machine! >OMG, I absolutely love it!! That table is TDF! >Wow, what a fantastic find! I adore how the chair has storage. More chairs need storage for odds and end, methinks. Genius! >Hey–I have a Pfaff 230 also! I don't think I've ever seen another one online. Mine is in a cherry colored cabinet, with two leaves rather than one, but otherwise looks identical. I think you'll find it's a workhorse–Mine sews sheers and 6 layers of denim with equal ease and is definitely my "go to" machine. I really like the knee lever, actually, once I got used to it. It doesn't skate all over my wood floors!Hope you enjoy your new machine! >It's awesome! Love the chair! Someday can you show how the knee pedal works? I don't quite understand…And your bathing suit looks great! >What a great find! 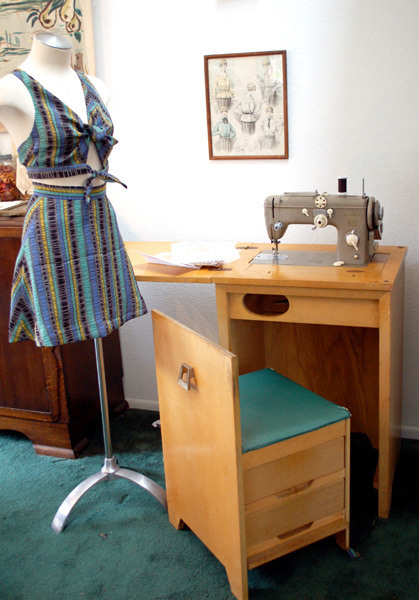 I feel like that table and chair would fit right into my sewing room!I dunno if you're new to vintage machines (new reader–I just clicked in from Gertie's blog), but I tell everyone I can how great they are. I lovelovelove my vintage 1940s Singer Featherweight, and use it for everything but buttonholes (which I could do with a buttonhole attachment, if I really wanted). The best part of vintage machines is the all-metal parts, which means that they will sew through anything (multiple layers of fur, leather, denim, etc) and last forever. Oh, and they sell for much less than modern machines, too, as you found. I tell people who are learning to sew to pick up a vintage machine as their first machine. There won't be a lot of doodads and features to confuse them, and even a mint condition vintage machine won't set them back nearly as much as a bottom-of-the-line modern machine. >great find! I've got my grandmother's black pfaff (from the late 50s) and I agree that they were so well made! HEAVY but sturdy! Um, that swimsuit is making me weak in the knees!! Awesome! >How fabulous! I particularly love the ingenious chair! >What a fabulous find! You're so lucky to get the chair, too. I wonder whether cleaning the motor would speed it up? >I've often wondered if it's possible to make a sort of hot-rod sewing machine…. If I get inside and monkey around, can I convince my machine to run faster?Loooove the table, especially the chair, it's too cool. >AWESOME Find! Ohhhhh and I love the swimsuit too! >Ooooo! She's lovely!! I discovered my grandma's green mid '50s Elna Supermatic a few months ago and ever since I've been trying to get used to that darn knee pedal! I'm still unsure with it and tend to just go back to my 'modern' Singer with a foot pedal after a few seams, but I'm determined to learn to use it eventually!! >LOL! I forgot about those knee pedals. 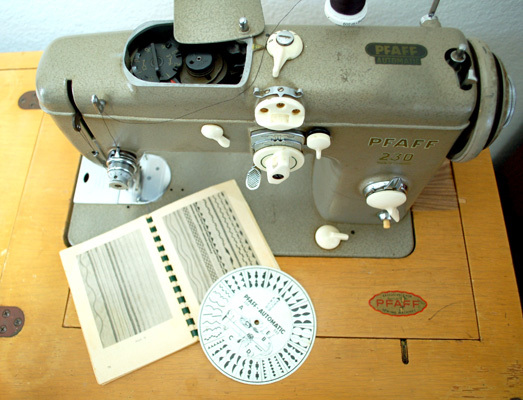 I grew up using my mom's Pfaff, about a 1958 version, and it had that pedal. Years later using a foot pedal is still hard for me. Great find! >Omg that machine is amazing!! What an insanely good find!! <3 PS: And cutie suit! >You lucky thang. I'm so jealous. It looks to be in superb condition. >What a cool find, I am a little bit envious. How come you get to buy vintage German machines in the US and no vintage machines at all in Germany? Not fair! ;-)I've never seen one of those sewing furnitures with a chair – amazing. And it obviously passed feline quality inspection, so you're all set.I learned sewing on a Bernina with knee-lever and I think that it gives you better control over the speed. >Thanks so much, everyone, for your nice comments on the machine! I agree that the furniture is half the fun!! Yay! !